Christmas Meeting 7.00 p.m. for 7.30 p.m. Monday 10 December A.G.M. Following a short AGM, Dr Diana Wilkins of the Reeves Archive will talk about the campaign for voting rights for women in Lewes. This year is the centenary of the 1918 Representation of the People Act and of the general election in which some women were able to vote for the first time, along with millions more men. Diana will show photographs from the Reeves Archive and the LSE Women’s Library that tell the story of the peaceful suffragists in Lewes. The talk will include the militant suffragettes who went on hunger-strike in Lewes prison and the local opposition to women’s suffrage. For the A.G.M. reports please see the final section of this Bulletin. As this is the Christmas meeting we shall be serving mulled wine and mince pies between 7.00 p.m. and 7.30 p.m. and there will be no entry charge for members. Chair’s Report. Please see below. Membership subscription changes. The committee recommend that the annual subscription should be changed to £6 p.a. per member. This will leave the subscription rate unchanged for couples and will represent a small reduction for the first member in each household. Appointment of officers. Krystyna Weinstein has been nominated to continue to serve as Secretary and Ron Gordon as Treasurer. There have been no nominations for the role of Chair and the committee propose that as an interim measure the duties should be shared between other committee members. Sue Berry has been co-opted to the committee. There is an “annual budget engagement exercise with partners” on Wednesday 12 December 2018, 11.00 am-12.30 pm, in the Council Chamber, County Hall, Lewes. The 3 January 1837 North Wales Chronicle, a newspaper that was no stranger to extreme weather, reported at length the consequences of heavy snow across England. It noted that an express from Lewes, dragged through the snow in a chaise and four, contained intelligence of a most dreadful and melancholy calamity in that town. At about noon an immense avalanche of snow had glided down from the Cliffe-hills at the back of Mr Hillman’s limekilns, and dashed in the roofs and entirely destroyed five houses, burying the unfortunate inmates under a mountain of snow. The report of the falling mass drew thousands of people to the spot, and so great was the excitement that it took a quarter of an hour for silence to be established. Every hand that could lift a spade set to work to extricate the unhappy creatures perishing beneath the ruins. A Mrs Robinson was dug out with a child at the breast, the mother dead. She had escaped at the first alarm, but rushed back into the house to save her children when the avalanche poured down upon the whole family and buried them alive. A Mrs Taylor was dug out just alive, but with very scant hopes of her surviving. Her eldest daughter and five other children had been taken out of the snow. It was impossible to know in the confusion how many people remained buried, and how many had been extricated. Men were still digging when the messengers left. Upwards of 14 human beings were involved in the destructive fall. At Landport 26 sheep belonging to Mr Tourle had been frozen to death, and Mr Verrall of Swanbar had lost 19 sheep and a horse by the same misfortune. The Ditchling mail-man was missing, supposed to have lost his life in the snow. The lad who brings the mail from Seaford to Lewes was almost buried, but succeeded in extricating himself and crawling to Northease, where he got two men to return with him to where he had left his horse, which they dug out of the snow. The mail-man to Uckfield and Tunbridge Wells was obliged to turn back, as he found the snow on Malling Hill twelve feet deep. A fly belonging to Mr Stevens went out of Lewes on Monday with a fare, but when the empty vehicle reached Ringmer Gate on its return the snow was over the palings. The driver got home as best he could on foot, but had not yet recovered from the ill-effects. Mr Stevens went with assistance to extricate his horse, but finding that could not be done he mercifully spared the poor animal the misery of dying from cold by shooting it outright. The 1858 Melville Directory includes, in addition to the usual local directory lists, a good number of advertisements for goods and services offered by Lewes businesses. One such advertisement was placed by the ‘Old Established Clock Manufactory’ of Tanner & Son, No.50, Cliffe, who described themselves as wholesale and retail watch and clock makers and silversmiths. They made all kinds of English clocks on the premises, and advertised three specific types of watches at different prices. They also sold silver and electroplate goods and wedding rings. They would give full value for old gold and silver, gold and silver lace and worn out watches. 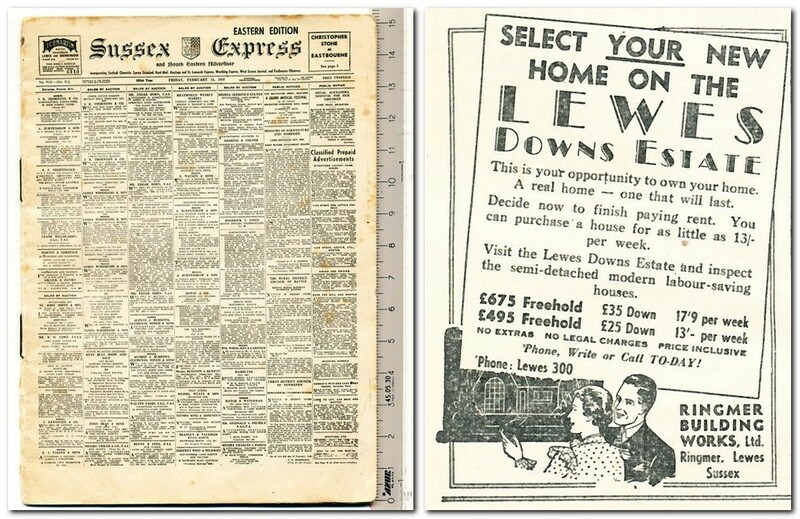 This particular newspaper, from February 1938, included a Ringmer Building Works advertisement for the latest new homes on the Lewes Downs Estate (now called the Nevill Estate), available with a 95% mortgage. 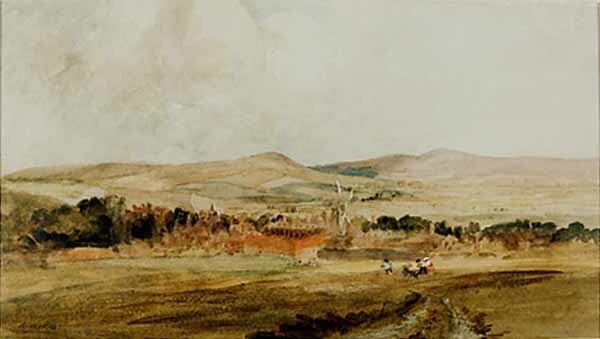 A watercolour by Alfred William Rich (below) is listed for sale at Gorringe’s weekly auction on 3 December 2018. 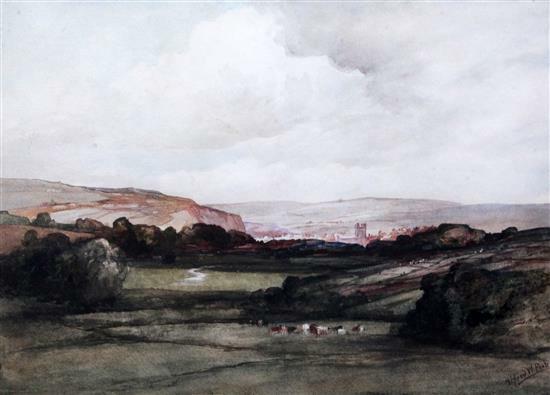 It is entitled ‘Valley of the Ouse, Sussex (Distant View of Lewes)’, and is estimated at £200-£300. The church tower is, unless I am mistaken, that of St John-sub-Castro. Alfred William Rich (1856-1921) was a professional artist born in Lindfield, Sussex, and best known for his watercolour landscapes. His parents were Stiles and Lucy Ann Rich, respectively from Tetbury, Glos, and Plymouth, and his elder siblings were born in Paddington, but he and two younger siblings were born in Lindfield. In 1861 & 1871 the family were in Hackney, where his father was a commercial clerk in a woollen goods warehouse. At the age of 15 Alfred was described as an engraver and designer. An elder sister was a Professor of Music and a brother an iron moulder. By 1881 the family had moved to Croydon, and Alfred and two of his sisters (including the former musician) were all described as artists. In 1884 he married Cassandra Philippa Berney, a surgeon’s daughter, at Croydon. In 1891 he was still in Croydon, described as a designer, engraver and die sinker, and his wife Cassandra Philippa was principal of a ladies’ school. He was again in Croydon in 1901, when Alfred was described as a landscape artist and his wife as a school principal. He gave addresses in Hassocks and Hurstpierpoint in the Edwardian era. By 1911, in his mid-fifties, he had moved to Fulham, where he was described as a water colour landscape artist and his wife was just described as ‘married’. He exhibited extensively in London galleries. He died in Tewkesbury in 1921. His works were influenced by the Impressionists, and he was an advocate of a natural approach, trying to capture the emotions a subject provoked rather than creating a photographic reproduction of the scene. He was highly regarded as a teacher of art, encouraging his students to draw and paint directly from nature, eschewing studios and easels but working from a camp chair, with his paper on a board held flat on his knees. He was a member of the New English Art Club from 1898, and not an admirer of the chocolate box paintings of the likes of Helen Allingham. He has several works in the collections of the Tate Gallery and the British Museum, and one watercolour in the Louvre. Alfred William Rich painted at least one other watercolour titled ‘Lewes, Sussex’ (below) that is thought to have been painted around 1900 and is now in the Manchester Art Gallery. I think that the windmill in the foreground is the one that stood behind Lewes Prison, so the view is taken from the track up to the Racecourse. To promote projects that engage local people in the development and dissemination of knowledge about the history of Lewes. Last year I reported that we had 263 members, and our current 2018 membership is well above that, at 315. We continue to see this incremental growth every year, which is very encouraging. We now have over 300 names on our “Information only” email contact list, also a new high, so we’re in touch with over 600 people in total. We’re delaying renewals for 2019 until after the AGM, where we will be proposing a (largely revenue-neutral) change in fees and structure. You will be able to renew your membership by post or at our January, February and March meetings, where new membership cards will be waiting for you. During the year we implemented a number of updates to documents and procedures to comply with the revised Data Protection Act 2018 and General Data Protection Regulations. Again, I’d like to thank everyone for their helpfulness over membership matters, which has made my job a continuing pleasure. The programme of monthly meetings covered a wide variety of topics and, in general, were well attended and very well received by our audiences. There was an average attendance of 176 per meeting during 2018 up to November. This was an increase of 20% compared to 2017. The two best attended meetings in 2018 were for Ian Everest’s talk ‘Tales from the Riverbank’ in April with 220, and Mat Homewood who drew in 199 for his talk about ‘The History of the Lewes Workshouse Building’ in June. A small but important part of the Group’s work is the Research Meetings programme. The purpose of these meetings is to enhance the expertise of LHG members who want to undertake research projects. During 2018 the focus has been on the regular quarterly meetings for the Street Stories project. We have continued to publish monthly editions of the Lewes History Bulletin, and passed the milestone of Bulletin no.100 in November. Barbara Merchant’s magic means that when you make relevant Google searches the relevant Bulletin articles generally pop up high on the list, but I maintain for my own use an electronic index of the Lewes people, places and topics mentioned, and if anyone would like a copy of the index for the first 100 Bulletins I would be happy to email it to you. As always the EC wants to do more to encourage the active involvement of members in research projects. Clearly not every member needs to be active but the EC would like to see a broad portfolio of projects evolve over the coming years. During the course of 2018 we extended our support for the Reeves project by providing financial support to the project on ‘The Lewes Campaign for Women’s Right to Vote’. The Street Stories project continues to be a key research initiative. We have several active groups and a programme of quarterly meetings to review progress and provide mutual support. Significant additions have been made to the reports on our web site from various groups including South Street by Heather Downie, Grange Road by Bridget Millmore and Abinger Place by Judy Gable. 33 Palmeira Mansions, Hove – 30 June – Private 90 min tour for 25 people. This large Victorian house is not normally open to the public and has a stunning grade II* listed interior that reflects the opulence, eclectic taste and lifestyle of its ‘nouveau riche’ owner in the 1890s. It’s a hidden gem of Brighton & Hove. The Regency Town House, 13 Brunswick Sq, Hove – 7 November – 60 min guided tour by the curator, Nick Tyson, for 23 people followed by a Regency-inspired 2-course lunch. RTH is a Grade 1 listed terraced property built in the 1820s as part of architect Charles Busby’s ‘Brunswick Estate’. Since 1985 it was been painstakingly restored with donations and grants and the work is ongoing. Neil encouraged members to attend a screening of the film ‘Peterloo’ at the Depot and invited attendees to meet to discuss the fill afterwards. In order to support projects the EC has always been keen to help members develop their skills and expertise. In September we organised a Family History course led by Mat Homewood. This was a 2 half day course attended by 13 members and was very well received. It followed on from several requests for help to ‘get started’ and included several ‘hands on’ exercises in getting useful information from census data. Jane Lee has been preparing a course, planned for February 2019, as an introduction to House/Street Research. This will be held at the Keep. Again this has been set up in response to several requests for help in ‘getting started’ with this kind of historical research. Website usage appears to be rising again at some 36,300 views of our website in the 12 months to mid-November 2018, averaging 99 views per day. The Website News section posts are sent to Facebook and Twitter, drawing followers to the website. A concerted effort to increase our Facebook presence to reach a new audience has resulted in an apparent rise in website views from a recent plateau. Most popular website pages in 2018 were events, research resources, Bulletins, and Street Stories reports. 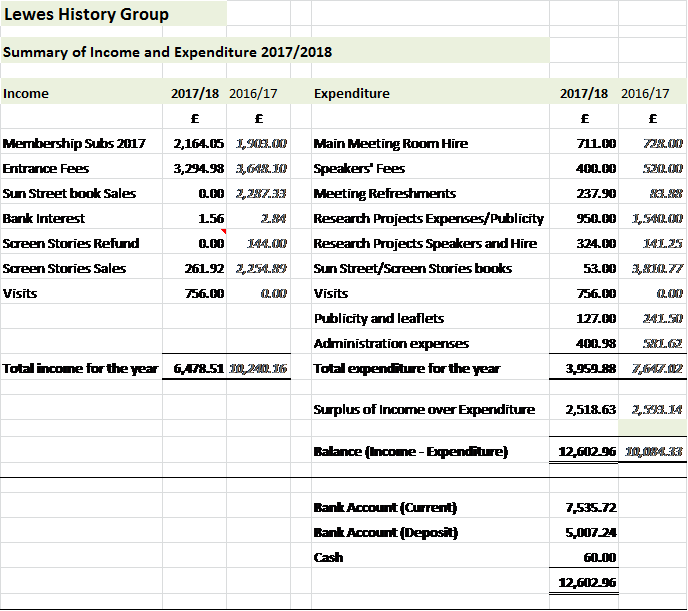 At the time of writing the LHG income for the year 1st Dec 2017 to 30th Nov 2018 was £6,478.51 and expenditure for the same period was £3,959.88. The significant change in income and expenditure compared to the previous year is accounted for by the sales income and production costs of publications in the previous year. At the start of the year the entrance fee for members was reduced to £1 and in view of the continuing healthy financial position a proposal to change the subscription rate will be presented at the AGM for approval. The end of year balance of £12,602.96 will enable the Group to continue to fund research projects. Minor adjustments to the figures given may be made if items of income or expenditure are recorded before the 30th November. The figures to be presented at the AGM meeting will be the final audited figures for the year. The EC is still keen to encourage members to come forward with project proposals if financial support is required. In addition, as we have made clear on previous occasions, the EC is happy to consider covering reasonable expenses in the pursuit of LHG projects where it is needed. If you have a need please let us know. Taking a stand at the Societies Fair in Sept.
A4 Posters in Tourist Office, Library, Barbican & Bow Windows Bookshop. Also the windows of members in St Thomas Court, South Street, Keere Street, Little East Street, Friars Walk, St Swithins Terrace, and the Pells & Nevill Estate notice boards. Using our social media accounts to promote our own and other local history events. The LHG leaflet had a reprint of 300 in June. The ambition of the LHGEC in 2018 continued with encouraging the development of research activities. The LHGEC now, thanks to Krystyna Weinstein has a Secretary. Both Ron Gordon as Treasurer and Krystyna Weinstein as EC Secretary are happy to continue in post for 2019. As already announced I will be stepping down from my role as Chairperson as from the AGM. At the time of writing no candidates have come forward to fill the post of Chairperson. In the meantime Sue Berry has kindly agreed to become co-opted member of the EC with immediate effect. The LHGEC is also keen to hear from anyone who would like to contribute to the work of the Group either via the EC or in some other capacity. If you are interested please get in touch. Ron Gordon, Ann Holmes, John Kay, Jane Lee, Barbara Merchant, Neil Merchant and Krystyna Weinstein. To all the people who have helped to run the Public Meetings. and everyone else who has helped out over the last year. My apologies to anyone in particular I may have unwittingly omitted. To Lloyd Raworth for continuing to support us with his design work . To Mike Stepney for auditing our accounts. And most importantly, to yourselves for your continued support; the members, the attendees at our meetings and the many others on our list of friends. This entry was posted in Art & Architectural History, Economic History, Environment History, Lewes, Local History. Bookmark the permalink.